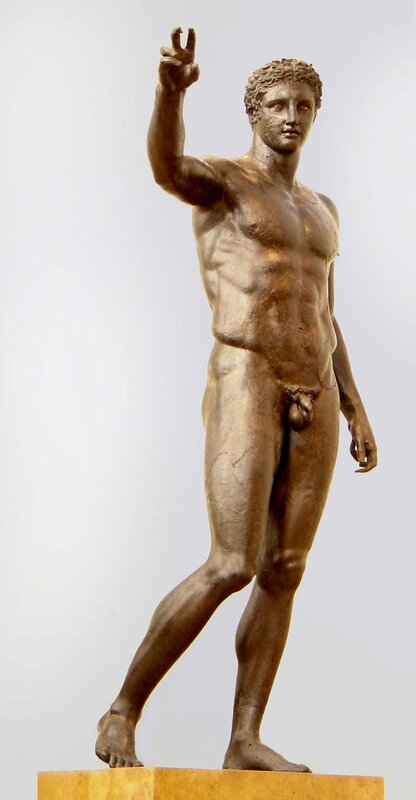 The Antikythera Ephebe is a bronze statue of a young man of languorous grace that was found in 1900 by sponge-divers in the area of an ancient shipwreck off the island of Antikythera, Greece. It was the first of the series of Greek bronze sculptures that the Aegean and Mediterranean yielded up in the twentieth century which have fundamentally altered the modern view of Ancient Greek sculpture. The wreck site, which is dated about 70-60 BC, also yielded the Antikythera Mechanism, an astronomical calculating device, a characterful head of a Stoic philosopher, and a hoard of coins. The coins included a disproportionate quantity of Pergamene cistophoric tetradrachms and Ephesian coins, leading scholars to surmise that it had begun its journey on the Ionian coast, perhaps at Ephesus; none of its recovered cargo has been identified as from mainland Greece. The Ephebe, which measures 1.94 meters, slightly over lifesize, was retrieved in numerous fragments. Its first restoration was revised in the 1950s, under the direction of Christos Karouzos, changing the focus of the eyes, the configuration of the abdomen, the connection between the torso and the right upper thigh and the position of the right arm; the re-restoration is universally considered a success. The Ephebe does not correspond to any familiar iconographic model, and there are no known copies of the type. 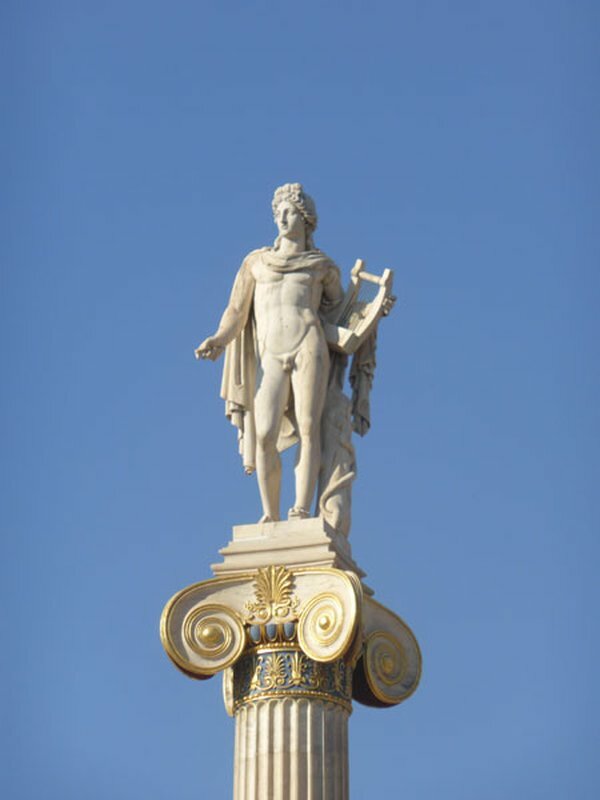 He held a spherical object in his right hand, and possibly may have represented Paris presenting the Apple of Discord to Aphrodite; however, since Paris is consistently depicted cloaked and with the distinctive Phrygian cap, other scholars have suggested a beardless, youthful Heracles with the Apple of the Hesperides. It has also been suggested that the youth is a depiction of Perseus holding the head of the slain Gorgon. At any rate, the loss of the context of the Antikythera Ephebe has stripped it of its original cultural meaning. The Ephebe, dated by its style to about 340 BC, is one of the most brilliant products of Peloponnesian bronze sculpture; the individuality and character it displays have encouraged speculation on its possible sculptor. It is, perhaps, the work of the famous sculptor Euphranor, trained in the Polyclitan tradition, who did make a sculpture of Paris, according to Pliny. The engraving on the banknote was made from a bronze bust of Democritus (460-370 BC). Roman copy from the Greek original. Stored in the Naples Archeological Museum (Italy), in the so-called Hall of Bronze statues from the villa of the papyri in Herculaneum. Democritus (/dɪˈmɒkrɪtəs/; Greek: Δημόκριτος, Dēmókritos, meaning "chosen of the people"; c.460 - c.370 BC) was an Ancient Greek pre-Socratic philosopher primarily remembered today for his formulation of an atomic theory of the universe. Democritus was born in Abdera, Thrace, around 460 BC, although there are disagreements about the exact year. His exact contributions are difficult to disentangle from those of his mentor Leucippus, as they are often mentioned together in texts. Their speculation on atoms, taken from Leucippus, bears a passing and partial resemblance to the 19th-century understanding of atomic structure that has led some to regard Democritus as more of a scientist than other Greek philosophers; however, their ideas rested on very different bases. Largely ignored in ancient Athens, Democritus is said to have been disliked so much by Plato that the latter wished all of his books burned. He was nevertheless well known to his fellow northern-born philosopher Aristotle. Many consider Democritus to be the "father of modern science". None of his writings have survived; only fragments are known from his vast body of work. Democritus was said to be born in the city of Abdera in Thrace, an Ionian colony of Teos, although some called him a Milesian. He was born in the 80th Olympiad (460–457 BC) according to Apollodorus of Athens, and although Thrasyllus placed his birth in 470 BC, the later date is probably more likely. John Burnet has argued that the date of 460 is "too early" since, according to Diogenes Laërtius ix.41, Democritus said that he was a "young man (neos)" during Anaxagoras's old age (c.440–428). It was said that Democritus's father was from a noble family and so wealthy that he received Xerxes on his march through Abdera. Democritus spent the inheritance which his father left him on travels into distant countries, to satisfy his thirst for knowledge. He traveled to Asia, and was even said to have reached India and Ethiopia. It is known that he wrote on Babylon and Meroe; he visited Egypt, and Diodorus Siculus states that he lived there for five years. He himself declared that among his contemporaries none had made greater journeys, seen more countries, and met more scholars than himself. He particularly mentions the Egyptian mathematicians, whose knowledge he praises. Theophrastus, too, spoke of him as a man who had seen many countries. During his travels, according to Diogenes Laërtius, he became acquainted with the Chaldean magi. "Ostanes", one of the magi accompanying Xerxes, was also said to have taught him. After returning to his native land he occupied himself with natural philosophy. He traveled throughout Greece to acquire a better knowledge of its cultures. He mentions many Greek philosophers in his writings, and his wealth enabled him to purchase their writings. Leucippus, the founder of atomism, was the greatest influence upon him. He also praises Anaxagoras. Diogenes Laertius says that he was friends with Hippocrates. He may have been acquainted with Socrates, but Plato does not mention him and Democritus himself is quoted as saying, "I came to Athens and no one knew me." Aristotle placed him among the pre-Socratic natural philosophers. The many anecdotes about Democritus, especially in Diogenes Laërtius, attest to his disinterest, modesty, and simplicity, and show that he lived exclusively for his studies. One story has him deliberately blinding himself in order to be less disturbed in his pursuits; it may well be true that he lost his sight in old age. He was cheerful, and was always ready to see the comical side of life, which later writers took to mean that he always laughed at the foolishness of people. He was highly esteemed by his fellow citizens, because as Diogenes Laërtius says, "he had foretold them some things which events proved to be true," which may refer to his knowledge of natural phenomena. According to Diodorus Siculus, Democritus died at the age of 90, which would put his death around 370 BC, but other writers have him living to 104, or even 109. Popularly known as the Laughing Philosopher (for laughing at human follies), the terms Abderitan laughter, which means scoffing, incessant laughter, and Abderite, which means a scoffer, are derived from Democritus. To his fellow citizens he was also known as "The Mocker". Democritus meditating on the seat of the soul by Léon-Alexandre Delhomme (1868). 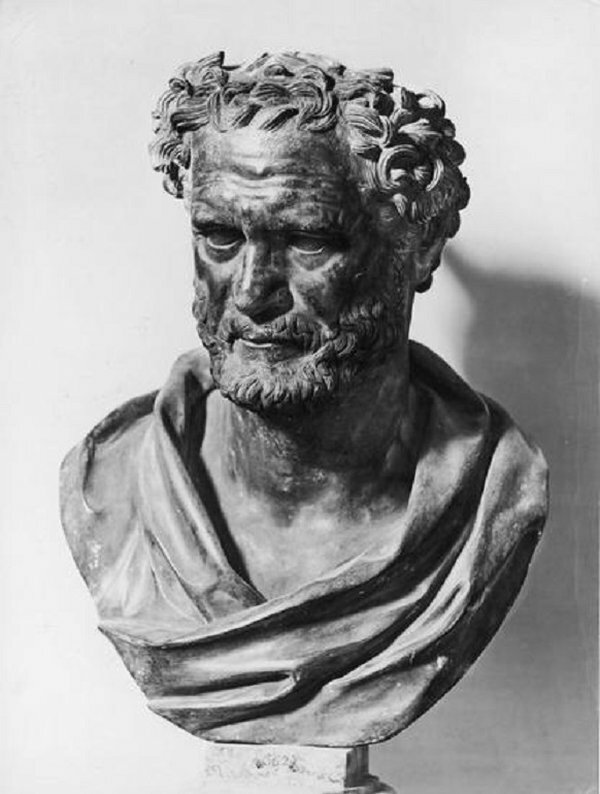 Most sources say that Democritus followed in the tradition of Leucippus and that they carried on the scientific rationalist philosophy associated with Miletus. Both were thoroughly materialist, believing everything to be the result of natural laws. Unlike Aristotle or Plato, the atomists attempted to explain the world without reasoning as to purpose, prime mover, or final cause. For the atomists questions of physics should be answered with a mechanistic explanation ("What earlier circumstances caused this event? "), while their opponents search for explanations which, in addition to the material and mechanistic, also included the formal and teleological ("What purpose did this event serve?"). Later Greek historians consider Democritus to have established aesthetics as a subject of investigation and study, as he wrote theoretically on poetry and fine art long before authors such as Aristotle. Specifically, Thrasyllus identified six works in the philosopher's oeuvre which had belonged to aesthetics as a discipline, but only fragments of the relevant works are extant; hence of all Democritus's writings on these matters, only a small percentage of his thoughts and ideas can be known. The theory of Democritus held that everything is composed of "atoms", which are physically, but not geometrically, indivisible; that between atoms, there lies empty space; that atoms are indestructible, and have always been and always will be in motion; that there is an infinite number of atoms and of kinds of atoms, which differ in shape and size. Of the mass of atoms, Democritus said, "The more any indivisible exceeds, the heavier it is". But his exact position on atomic weight is disputed. Leucippus is widely credited with having been the first to develop the theory of atomism, although Isaac Newton preferred to credit the obscure Mochus the Phoenician (whom he believed to be the biblical Moses) as the inventor of the idea on the authority of Posidonius and Strabo. The Stanford Encyclopedia of Philosophy notes, "This theologically motivated view does not seem to claim much historical evidence, however". Democritus, along with Leucippus and Epicurus, proposed the earliest views on the shapes and connectivity of atoms. They reasoned that the solidness of the material corresponded to the shape of the atoms involved. Thus, iron atoms are solid and strong with hooks that lock them into a solid; water atoms are smooth and slippery; salt atoms, because of their taste, are sharp and pointed; and air atoms are light and whirling, pervading all other materials. Using analogies from humans' sense experiences, he gave a picture or an image of an atom that distinguished them from each other by their shape, their size, and the arrangement of their parts. Moreover, connections were explained by material links in which single atoms were supplied with attachments: some with hooks and eyes others with balls and sockets. The Democritean atom is an inert solid (merely excluding other bodies from its volume) that interacts with other atoms mechanically. In contrast, modern, quantum-mechanical atoms interact via electric and magnetic force fields and are far from inert. The theory of the atomists appears to be more nearly aligned with that of modern science than any other theory of antiquity. However, the similarity with modern concepts of science can be confusing when trying to understand where the hypothesis came from. Classical atomists could not have had an empirical basis for modern concepts of atoms and molecules. However, Lucretius, describing atomism in his De rerum natura, gives very clear and compelling empirical arguments for the original atomist theory. He observes that any material is subject to irreversible decay. Through time, even hard rocks are slowly worn down by drops of water. Things have the tendency to get mixed up: Mix water with soil and mud will result, seldom disintegrating by itself. Wood decays. However, there are mechanisms in nature and technology to recreate "pure" materials like water, air, and metals. The seed of an oak will grow out into an oak tree, made of similar wood as historical oak trees, the wood of which has already decayed. The conclusion is that many properties of materials must derive from something inside, that will itself never decay, something that stores for eternity the same inherent, indivisible properties. The basic question is: Why has everything in the world not yet decayed, and how can exactly some of the same materials, plants, and animals be recreated again and again? One obvious solution to explain how indivisible properties can be conveyed in a way not easily visible to human senses, is to hypothesize the existence of "atoms". These classical "atoms" are nearer to humans' modern concept of "molecule" than to the atoms of modern science. The other central point of classical atomism is that there must be considerable open space between these "atoms": the void. Lucretius gives reasonable arguments that the void is absolutely necessary to explain how gasses and liquids can flow and change shape, while metals can be molded without their basic material properties changing. Bottom, right is the building of The nuclear research center "Democritos". The National Center of Scientific Research "Demokritos" (NRCPS; Greek: Εθνικό Κέντρο Έρευνας Φυσικών Επιστημών (Ε.Κ.Ε.Φ.Ε.) "Δημόκριτος") is a research center in Greece, employing over 1,000 researchers, engineers, technicians and administrative personnel. It focuses on several fields of natural sciences and engineering and hosts laboratory facilities. The facilities cover approximately 150 acres (61 hectares) of land at Aghia Paraskevi, ten kilometers from the center of Athens, on the northern side of Hymettus mountain. The buildings cover an area of approximately 35.000 m2 (8.6 acres). 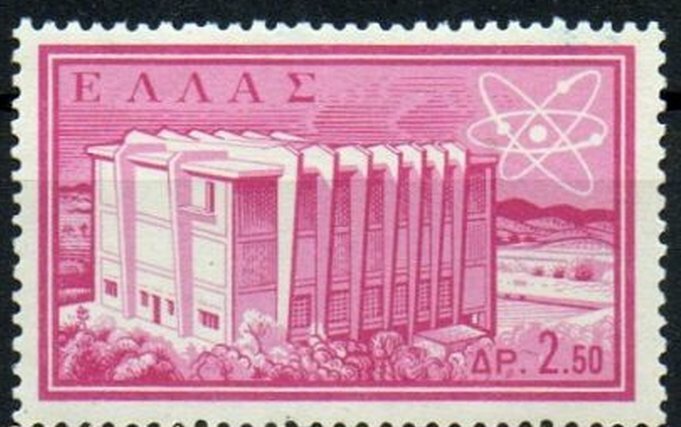 The Centre started its operation in 1959 as an independent division of the public sector under the name Nuclear Research Center "Demokritos", named in honour of the Greek philosopher Democritus. In 1985 it was renamed and given self-governing jurisdiction under the auspices of the General Secretariat of Research and Technology. The original objective of the newly created center was the advancement of nuclear research and technology for peaceful purposes. Today, its activities cover several fields of science and engineering. The NCSR is a self-administered governmental legal entity, under the supervision of the General Secretariat of Research and Technology of the Ministry of Education. Institute of Materials Science (IMS). Institute of Informatics and Telecommunications (IIT). Institute of Nuclear Technology - Radiation Protection (INT-RP). Institute of Radioisotopes & Radiodiagnostic Products. The INT-RP at Demokritos operates Greece's only nuclear reactor, a 5 MW research reactor. On left side is the symbol of Atom. Denominations in numerals are in three corners, in words centered. The main building of the Academy of Sciences in Athens. 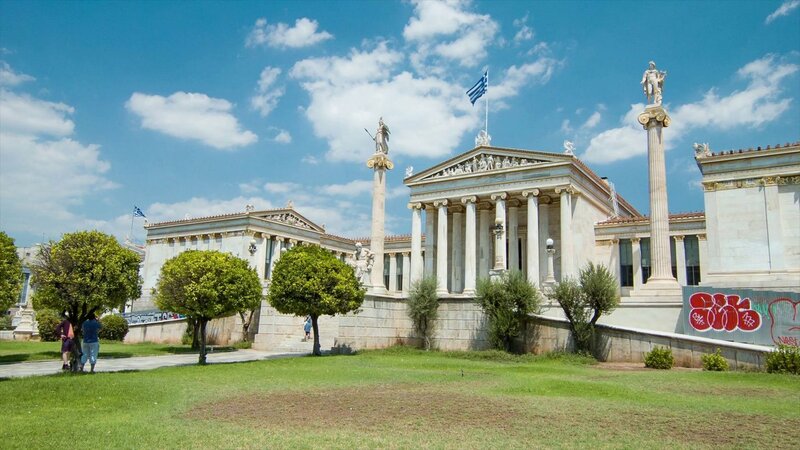 The building of the Academy of Sciences is located in Athens, the capital of Greece. 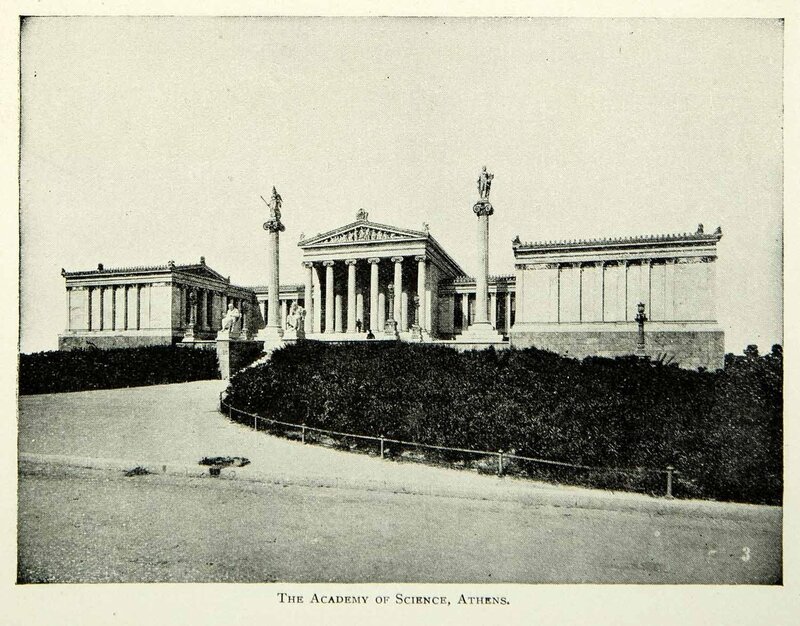 The foundation of the Athens Academy was March 18, 1926. The name is given according to the most ancient Academy of Plato, which was opened in 385 BC. In those days, the name was received on behalf of the hero of the ancient legends of Academ. According to the Charter, the function of the Academy is divided into 3 branches: morality and political science, natural science, and art. The main building of the Academy is a neoclassical building between Panepistimiou Street and Akadimias Street in the centre of Athens. The building was designed as part of an architectural "trilogy" in 1859 by the Danish architect Theophil Hansen, along with the University and the National Library. Funds had been provided by the magnate Simon Sinas specifically for the purpose, and the foundation stone was laid on 2 August 1859. Construction proceeded rapidly, after 1861 under the supervision of Ernst Ziller, but the internal tumults during the latter years of King Otto's reign, which resulted in his ousting in 1862, hampered construction until it was stopped in 1864. Works resumed in 1868, but the building was not completed until 1885, at a total cost of 2,843,319 gold drachmas, most of it provided by Sinas, and, after his death, by his wife Ifigeneia. 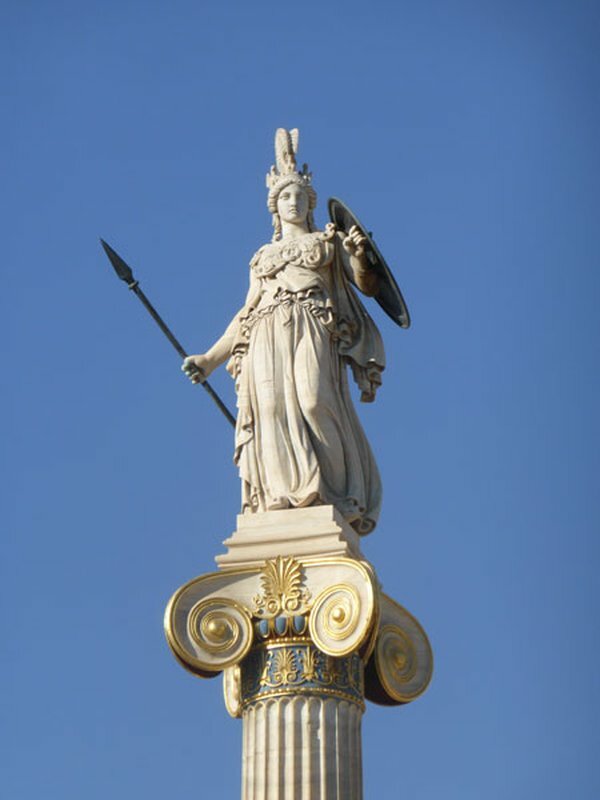 The Greek neo-classical sculptor Leonidas Drosis sculpted the principle multi-figure pediment sculpture, on the theme of the birth of Athena, based on a design by painter Carl Rahl. This brought first prize at the Vienna Exhibition of 1873. 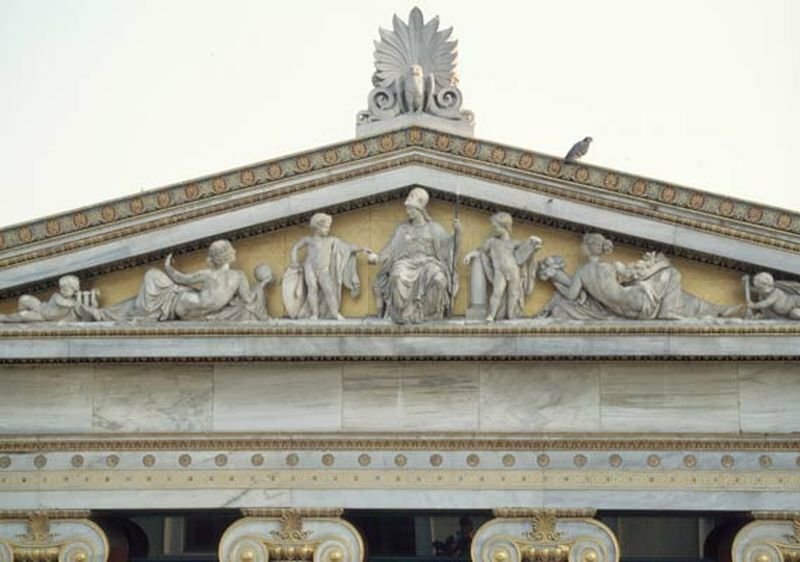 Drosis is also responsible for the figures of Athena and Apollo with lyre on the Academy's flanking pillars, and the seated marble figures of Plato and Socrates, which were executed "by the Italian sculptor Piccarelli". The eight smaller pediments in the Academy complex are the terra-cotta work of Austrian sculptor Franz Melnitzky. Interior murals and paintings were done by the Austrian artist Christian Griepenkerl. On 20 March 1887, the building of the "Sinaean Academy", as it was called, was delivered by Ziller to the Greek Prime Minister, Charilaos Trikoupis. In the absence of a national Academy, the building was used for housing the Numismatic Museum in 1890, and in 1914 the Byzantine Museum and the State Archives. 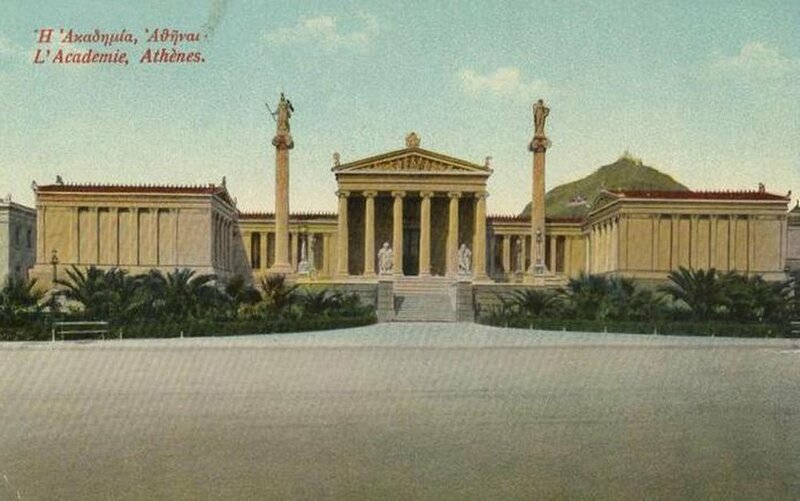 Finally, on 24 March 1926, the building was handed over to the newly established Academy of Athens. 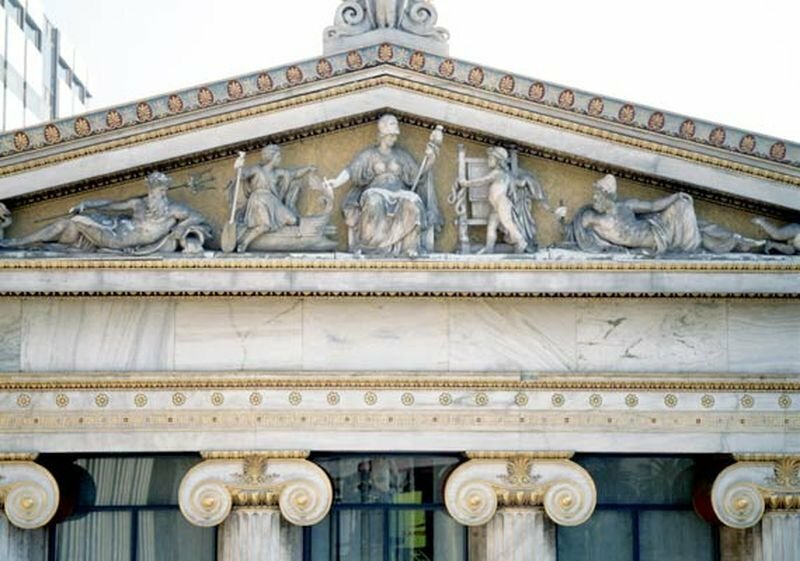 On either side of the building's prostyle there are two statues: On the right that of Apollo the guitar-player (3.71 m. high), and on the left that of Athina the defender (4.11 m. high). Both are mounted on pillars in the Ionian rhythm (the overall height is 23.25 m.), and are works by Drosis. In the forecourt to the entrance of the Academy, there are two more statues (2.40 m. high), both seated; on the left - Plato and on the right - Socratis. The models for these statues were executed by Drosis and they were then sculpted out of marble from the mountain of Penteli by the Italian sculptor Piccarelli. They were placed in their present location in 1885. On the same site there are also marble lamp-posts. Their bases are decorated on all four sides with heads of Dias in relief, and on the four corners with owls sculpted in the round. 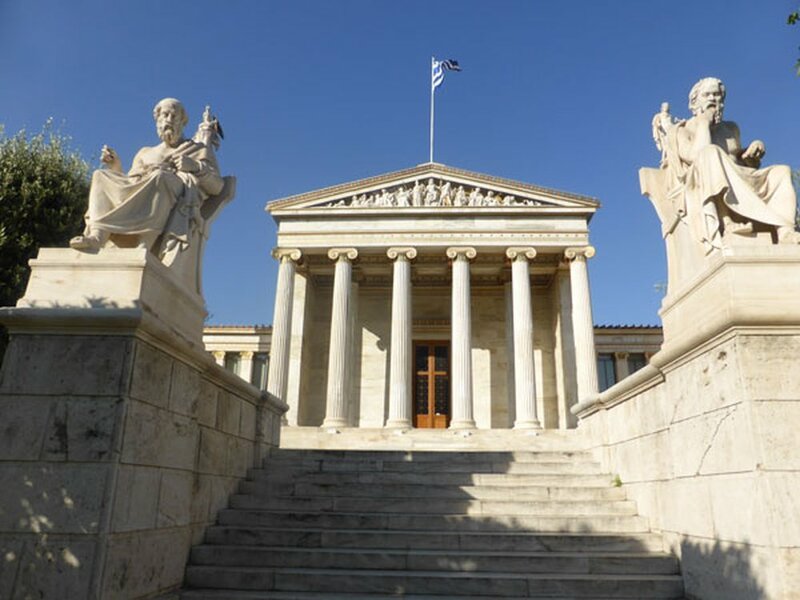 The Building of the Academy of Athens has a rich sculptural decoration, which was executed over the course of a decade, from the 1870s up to the mid 1880s. The major part of the decoration is the work of the sculptor Leonidas Drosis (1843-1884), Professor at the Scholeion Technon, as the Polytechnic was then known, who had studied in Munich and Dresden on a scholarship from Simon Sinas. The main sculptural decoration is found on the pediment of the entrance to the Academy. It consists of a representation of the birth of Athena, sculpted in the round. This masterly work of art is a multiple-figured composition, based on a design by the great Austrian painter Karl Rahl. It is the work of Drosis and elicited the first prize at the exhibition of Vienna in 1872. Denominations in numerals are in three corners, in words lower, centered. Engravers: L. Orphanos, G. Angelopoulos. Designers: G. Velissaridis, I. Stinis.